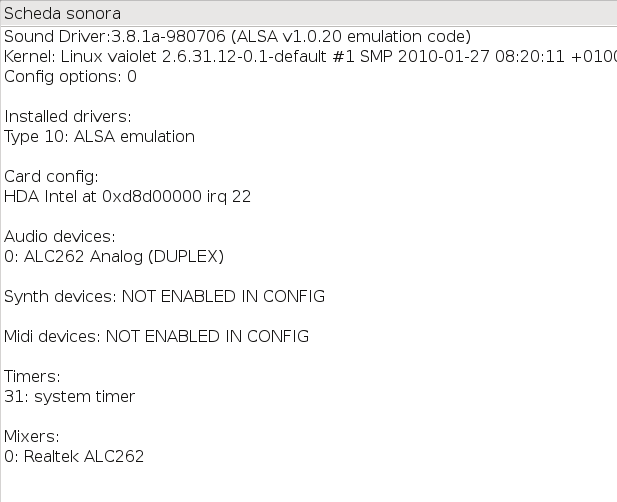 Discussion Sony Vaio CW - Incorporated mic doesn't work! Sony Vaio CW - Incorporated mic doesn't work! The incorporated mic in my new Sony Vaio CW doesn't works in Linux, but works well in Windows7. I tried with Opensuse 11.2, Kubuntu Karmic, Linux Mint KDE 7 and 8, Fedora 12 KDE. well, start w/ a lshw so we can see what kind of hardware you have. The sounds card, in particular. Also, are you using ALSA or OSS? It may be something as trivial as turning up the volume of the mic in the alsa mixer. Please, I'm looking for help!! product: Marvell Technology Group Ltd.